Douglas Nierras Powerdance (DNPD), a dance company established back in February 1988, will be celebrating the culmination of its 30th year of uplifting the Filipino dance culture this coming February 16 & 17, 2019. 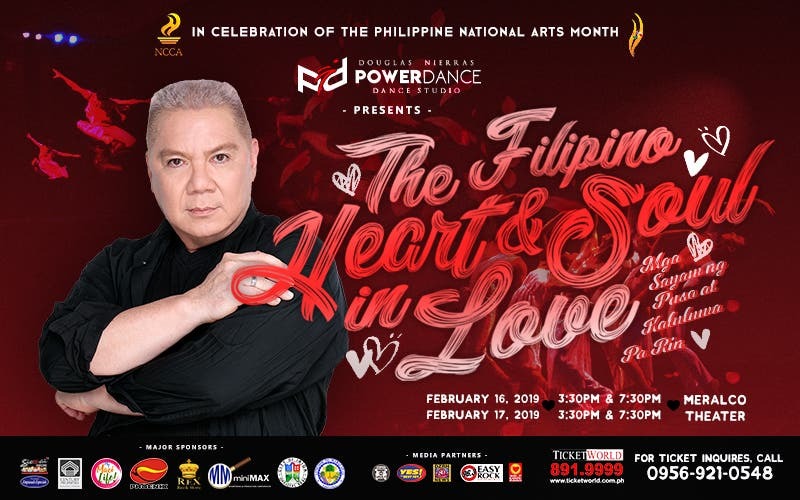 Led by the dance icon Mr. Douglas Nierras himself, DNPD will be holding their dance concert entitled “The Filipino Heart & Soul in Love: Mga Sayaw ng Puso at Kaluluwa Pa Rin” at the Meralco Theater. The performance is choreographed and directed in its entirety by Mr. Douglas Nierras – Winner of 10th Saitama International Creative Dance Concourse 1999 – 2000 and more popularly seen on GMA 7’s Starstruck, ABS-CBN’s I Can Do That, Stardance, and Shall We Dance, Celebrity Dance Challenge and Dancing Nation of TV 5. In this 30th milestone for the DNPD, the audience will experience a night of dazzling performances filled with never before seen dance choreography in conjunction with video-interactive 4D performances which will show just why DNPD is the leading jazz-contemporary dance group in the Philippines. “The video breathes with the dancers.” states Mr. Douglas Nierras when asked about the expected highlight of the show which will be the 4-dimensional dance choreography. The National Commission for Culture and the Arts (NCCA) has endorsed the “The Filipino Heart & Soul in Love: Mga Sayaw ng Puso at Kaluluwa Pa Rin” as a must-see event for the celebration of the Philippine National Arts Month this February. The ensemble of the concert will be filled with current and returning members of the DNPD: Froilan Dabalus, Christaliza Dabalus, Ronald Policarpio, Ric Mar Policarpio, Kate Jacob, JR Calumpiano, Joshua Orbasido, Divine Dacles, Railey Bugador, Ronjiek Gamayon, Mimi Villanueva, Cheska Quimno and more. In recognition of Mr. Douglas Nierras’ personal vision and subsequently the inherited legacy and passion from the dance guru, proceeds from this concert will go to the mission of educating aspiring dancers which is supported by our major sponsors; Siomai House, Century Properties, MaxCEEmum Corp., Phoenix Fuels, Rex Publishing, Minimax Advertising, the local government units of Iriga City and Mabalacat City. Tickets are now available at Ticketworld.net or contact us at 09589210458. For more news and updates about the concert, visit our official Facebook page (facebook.com/dnpd88).